The Greekpreneur Program by stuff4GREEKS – Earn extra income with your own online Greek store, but without the hard work. The Greekpreneur Program by stuff4GREEKS Earn extra income with your own online Greek store, but without the hard work. Backed by our state-of-the-art resources, talent, and experience. Leave the fulfillment and service to us. 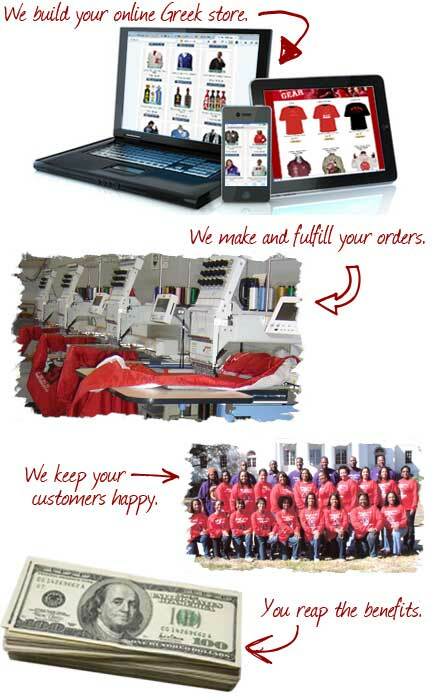 Ever wanted to run your own Greek apparel business, but you weren't quite sure where to start? The Greekpreneur Program is a full-service web store development and order fulfillment solution for entrepreneurs looking to earn extra residual income selling fraternity and sorority merchandise online. Learn more. Looking to make some extra income without having to sacrifice a lot of time and work? Do you need your own Greek apparel website, but don't have the time or resources to build one? If you answered "yes" to any of these questions, then the Greekpreneur program may be for you. Take the tour. Do you have tons of creative ideas for Greek paraphernalia brewing in your head, but need a company to bring them to life for you? The Greekpreneur Program is powered by stuff4GREEKS - the world's leading manufacturer of uniquely customized Greek gear. Any Greek store can sew some letters on a shirt... but only S4G can make you a masterpiece. You can choose to offer any of our eye-catching designs, or offer your own original concepts. Get started. Start your own online Greek store and earn extra money without the hard work. We fulfill your orders, handle your customer service, and do all of the heavy lifting for you. Plus, you'll learn invaluable business and marketing secrets along the way. Limited spots available. Get started now.